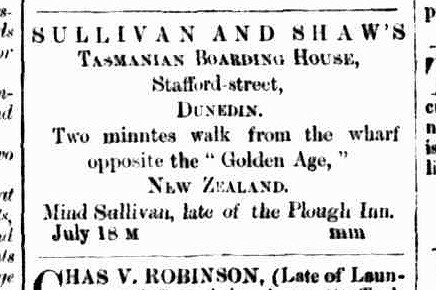 Charles St, near York St. 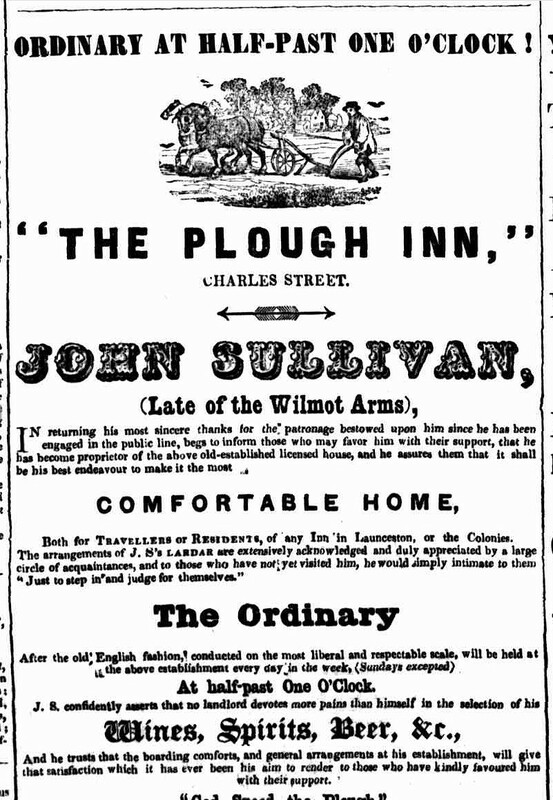 There were at least three buildings licensed as the Plough Inn. 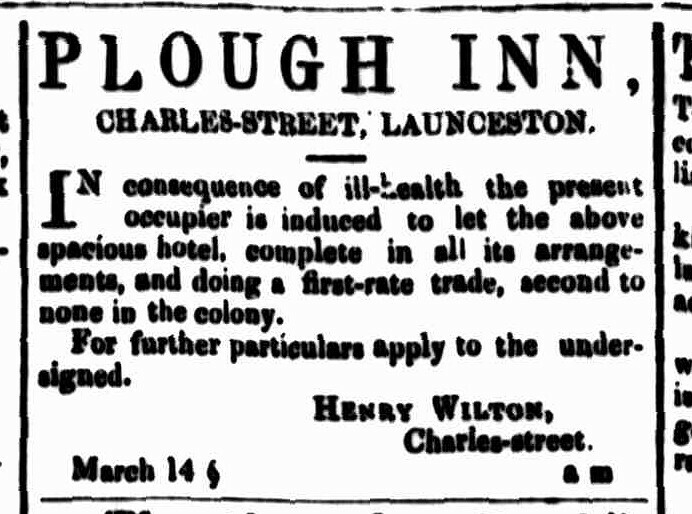 William Field, one of the first hoteliers in Launceston, had a Plough Inn in Brisbane St in the 1820s. 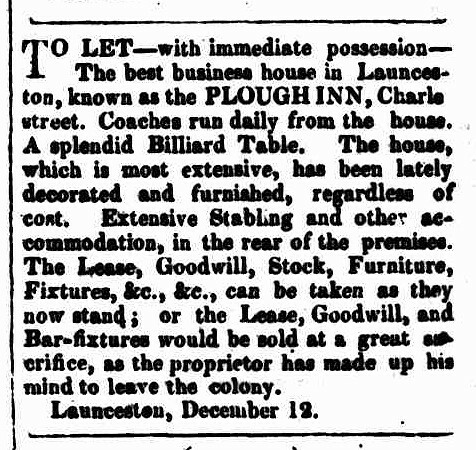 After that, until 1864, the Plough Inn was in Charles St, where it was the terminus for coaching services. 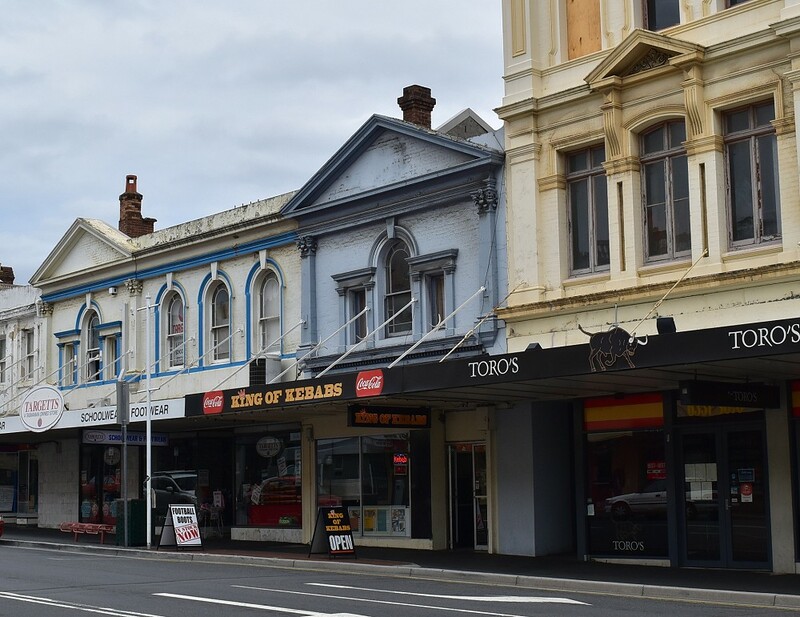 The license changed hands often, including returning to an original proprietor. 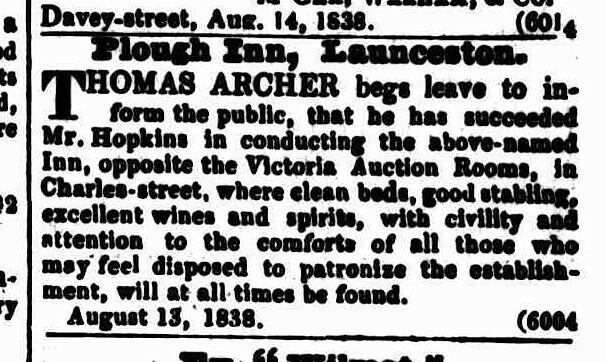 One, Thomas Archer, moved to Carrick and established a hotel by the same name. 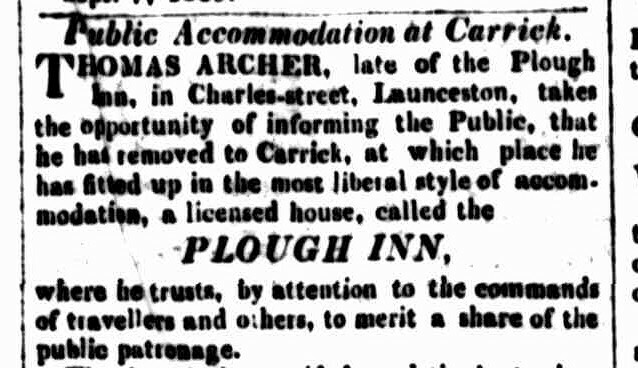 After the Plough ceased operating, the name was transferred to the Turf Hotel, on the corner of Patterson & Charles St, which at the time was in the hands of Walter Harris, a previous licensee of the Charles & York property. 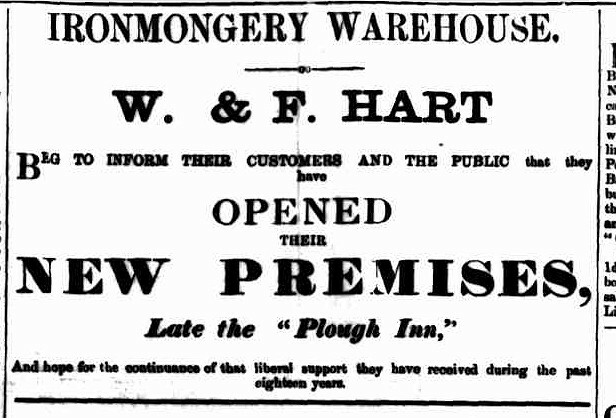 Former W. Harts & Sons building that replaced the Plough. 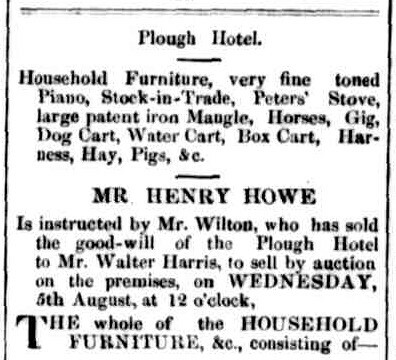 The Plough inn, a part of which still exists in W. Hart and Sons and the adjoining building. 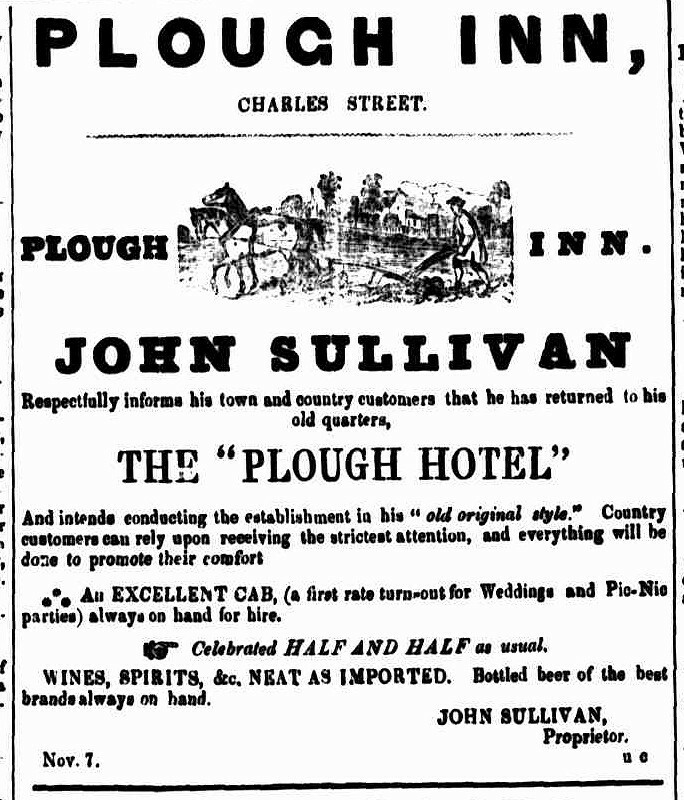 The Plough was the meeting place of many notable characters in the old days. 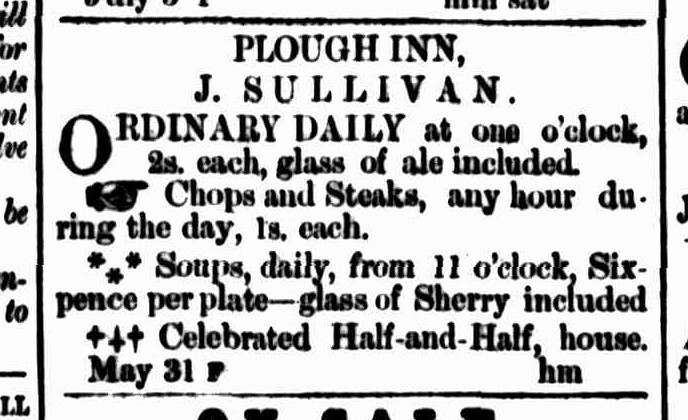 1860 John Sullivan, Plough Inn, Charles street. Granted. 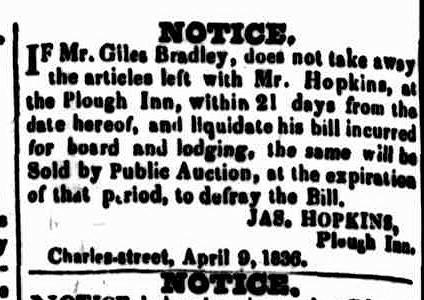 Another inquest was held on Tuesday evening, the 28th instant, at the Plough Inn, Charles-street, on the body of an infant child of Mr. Archer, the landlord of the above inn. It appeared that the child’s clothes accidentally caught fire on Sunday morning, and it was so dreadfully burnt as to cause death. Verdict— Accidental death. Albert Harmon Bays was then placed at the bar. 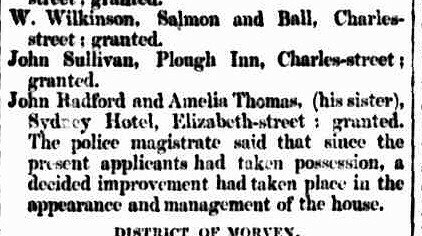 charged with feloniously receiving, on the 20th of November, nine bagatelle balls, the property of Mr. Charles Grant, well knowing the same to have been stolen. 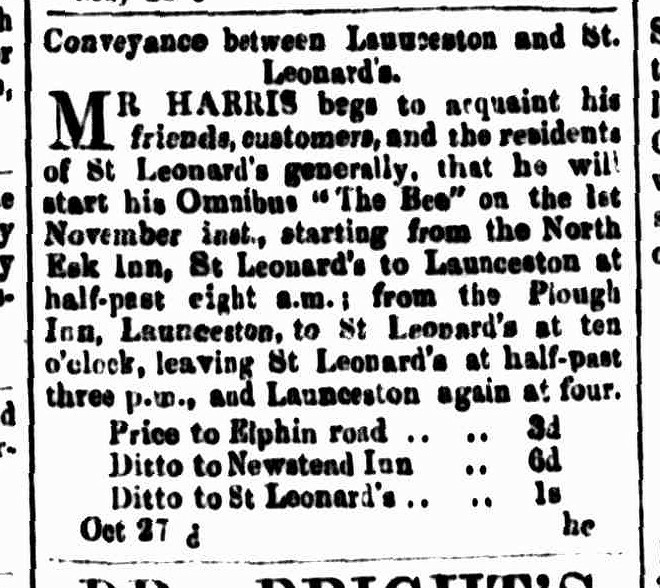 Mr. Charles Grant examined by Mr. Kennedy.— I am a publican, and keep the Plough Inn in Launceston ; on the 9th November I had nine bagatelle halls, but missed them on that day ; I saw them about a couple of hours before missing them; the next time I saw them was in possession of Constable Davis, two months afterwards; I had had the balls for two years, and lost them all at one time ; they were not all of the same size, one was less than the others, I should know one of them again; the small ball was white, one of the other eight balls was red; when I saw the balls with Constable Davis the red ball was turned into a white one, but I recognised it not withstanding; the seven balls produced I believe to be mine, I am positive about the other two; they are worth five shillings each ; I know one ball by a hole which was there when I bought it. By the Court.- saw the balls on the same day I missed them : I can swear to the ball with the plug in it. 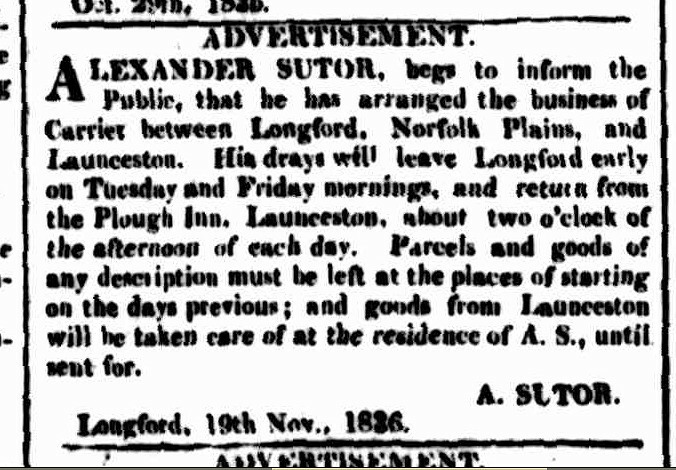 Last night, about eight o’clock, the premises of Messrs. Aaron and Saul Solomon, known as the “Red House,” in Charles-street, and formerly occupied by Messrs. Moss and Nathan were discovered to be on fire, and scarcely had the alarm been given, ‘ere the whole of the building was enveloped in flames. 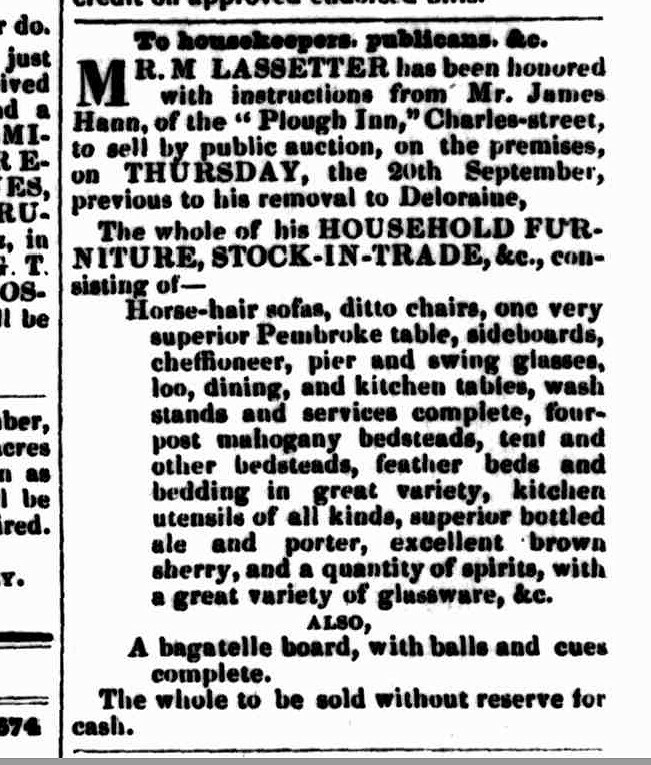 The adjoining houses speedily caught fire, and by ten o’clock, the range of buildings between Mr. Lassetter’s Auction Mart, and the premises of Mr. Webster, the ironmonger was entirely destroyed. 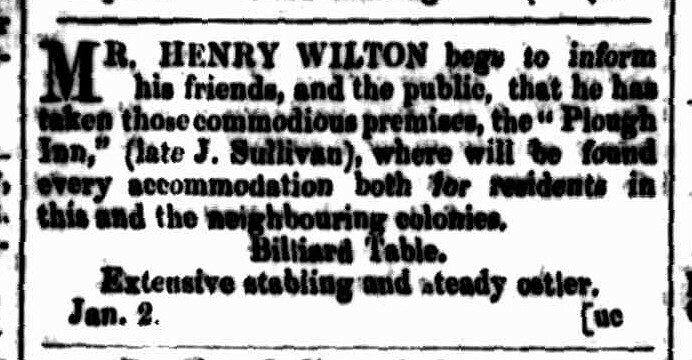 Mr. Higgs, the pastry-cook, Mr. Sykes, the tobacconist — the house lately occupied by Mr. Bertram Nathan, and a Baker’s on the south side of the Red House, together with numerous outbuildings in the rear, were burnt out. 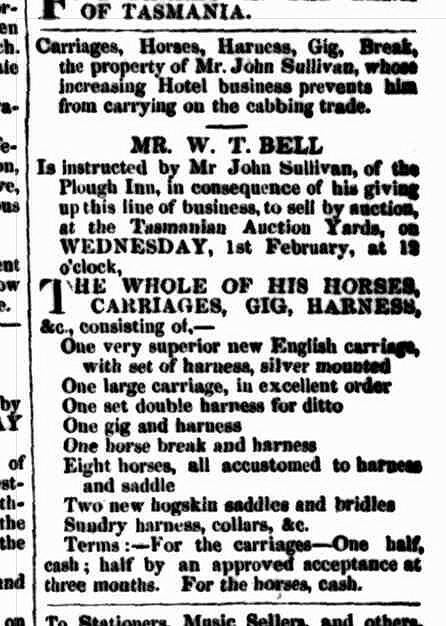 The fire is said to have originated in the carelessness of a lad who was in Messrs. Solomon’s shop, and it was with some difficulty that the children of Mrs. Solomon, and Mrs. Higgs, were rescued from destruction. 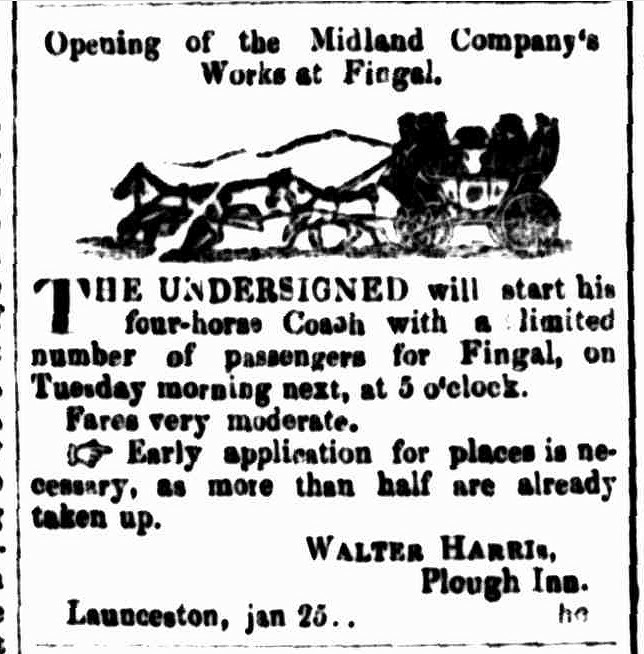 The fire had been raging nearly three quarters of an hour before the engines made their appearance and when at length that belonging to the Cornwall Insurance arrived there was scarcely any water on the spot for its use. The engines of the Tasmanian, Derwent and Tamar, and a smaller one belonging to the garrison, succeeded, and as soon as possible began to play upon the adjoining property of Mr. Webster and Mr. Lassetter, to save which now became the principal object. 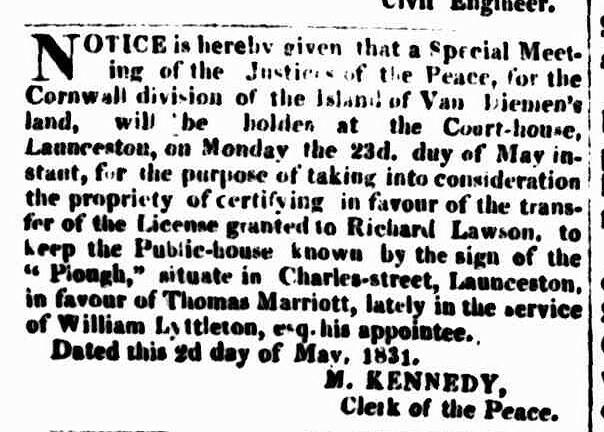 Several detachments of the Military were brought up in double quick time, and a number of the men were set to work to pull down the wooden buildings in the rear, so as to prevent the flames from communicating with the houses in York and Elizabeth-streets, which at one time were considered in danger. The evening was calm, but had the wind blown from the south or east, the destruction of property would have been much more serious. 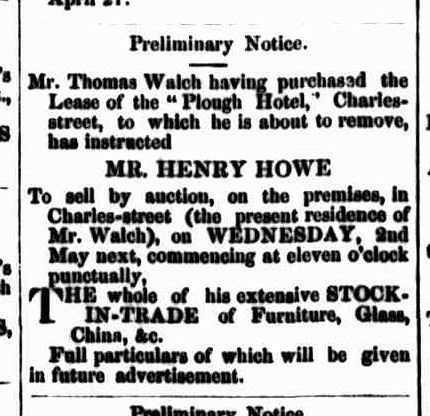 The spacious premises of Messrs. Moss & Nathan at the corner of Charles and York-streets including the lofty store lately erected by those gentlemen, and the adjoining houses, as also the Plough Inn, and Mr. Lassetter’s Auction Mart, were at one time thought to be doomed. 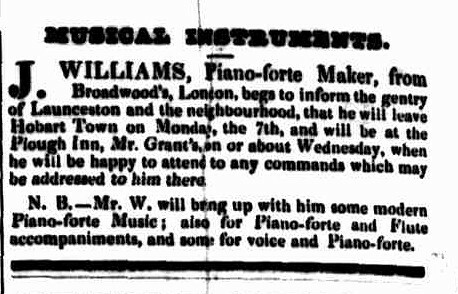 Mr, Brooks’ shop at the corner of Elizabeth and Charles-streets, and all the buildings down in the direction of Wellington-street, were far from being secure. THE LATE FIRE IN CHARLES-STREET. 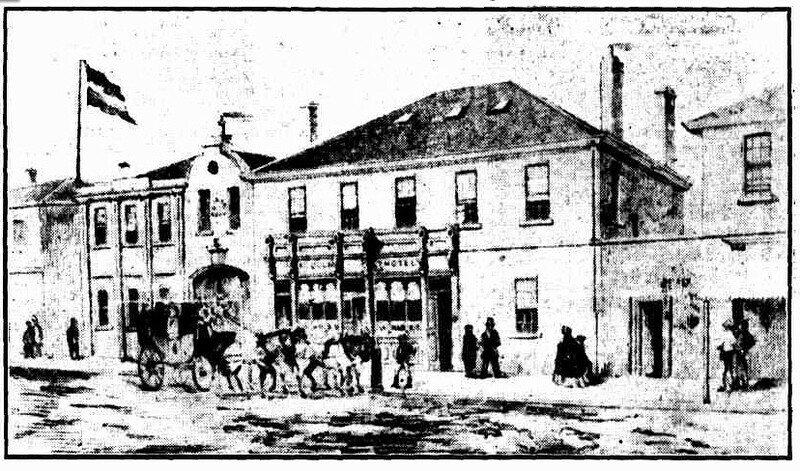 Coroner’s inquiry into the cause of the fire. 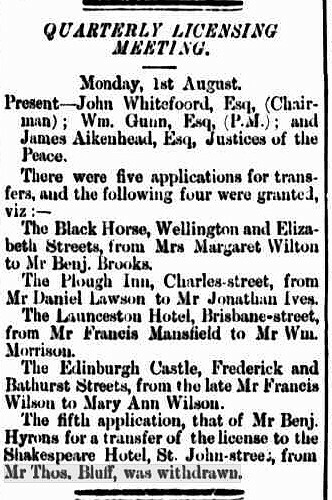 At the suggestion of several influential inhabitants, and with a view to satisfy the public mind on the circumstances of the late fire, a jury of twelve was directed by William Tarleton, Esq., Coroner, to be summoned at the house of Mr. James Hann, Plough Inn, Charles-street, on Friday afternoon, at three o’clock. There were ten applications for new licenses. Of these, two were for previously licensed houses, and another was for a person who had held a license, and it was put to the meeting whether all these should be placed on the same footing, when it was decided that the two previously licensed houses should have the preference. 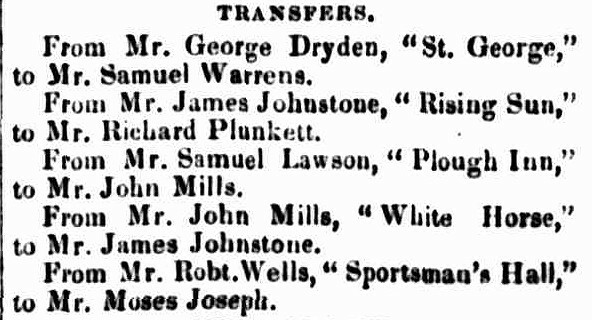 The applications were then read; one from John M’Kenzie for the “Farmers’ Arms,” lately kept by Mr. Mason ; the other from Thomas Lawson, jun., for the “Plough Inn,” Charles-street, which latter was granted. 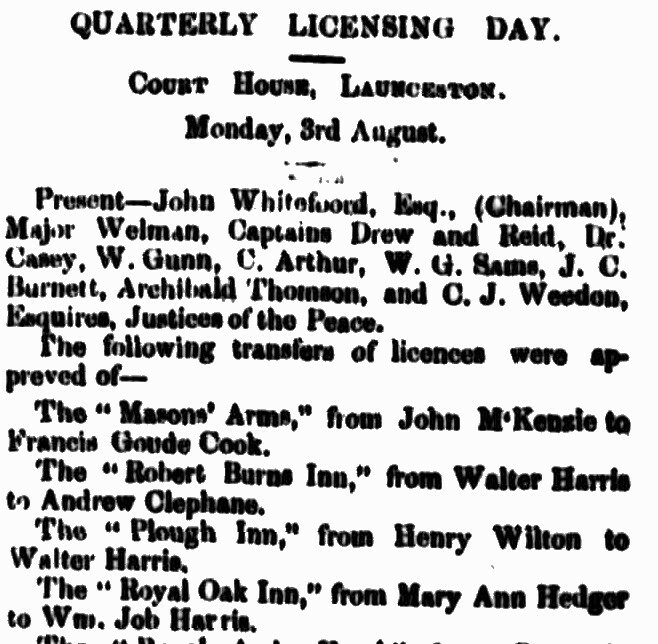 The remaining nine stood over for consideration on the adjourned licensing day. 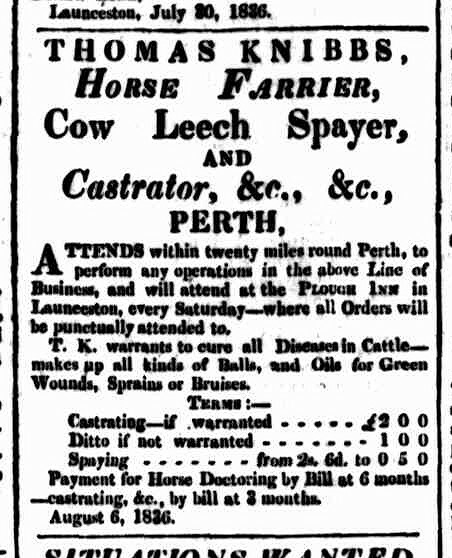 Breach of Licensed Victuallers’ Act. 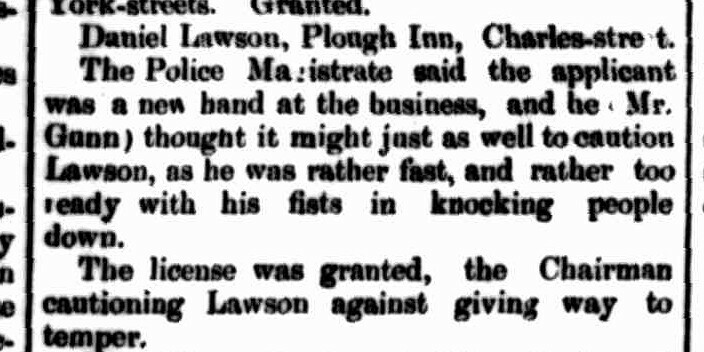 Daniel Lawson, landlord of the Plough Inn, was fined 10s. with 7s. 6d. 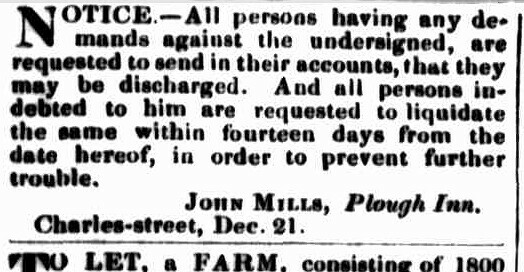 costs, for not having the lamp at his licensed house lighted on the night of the 21st instant. 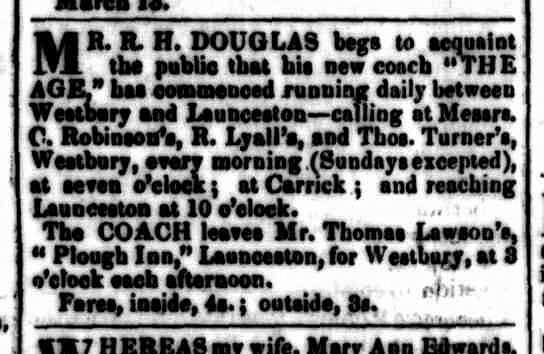 Mr Douglas said, with reference to the Plough Inn, the occupier was obliged to close it as its new proprietor, Mr Hart, required it for his own business, and it was the same with regard to the Angel Inn. This entry was posted in Charles Street, Hotel and tagged location, long gone, photo by Xenith. Bookmark the permalink.